For many people, sports headphones are more about working out than listening to tunes. We’re looking for sweatproof, water-resistant, tangle-free earbuds that let deliver adequate musical performances while allowing just a bit of ambient noise to creep in so we can jog on the street without fear of being run over. If you’re as passionate about exhilarating audio performances as you are great workouts, you might not mind that Sennheiser’s MX 686G Sport earbuds don’t have some of the whiz-bang features you’ll see in some of its competitors. The MX 686Gs are the only sports earbuds in our round-up that aren’t clunky and oversized, probably because they’re the only earbuds in our round-up that aren’t riding on a gimmick. There’s no built-in heart rate monitor, they’re not wireless; in fact, they’re not designed for anything other than excellent audio while you work out. Sometimes simpler is better; cheaper, too: the MX 686Gs cost just $70. 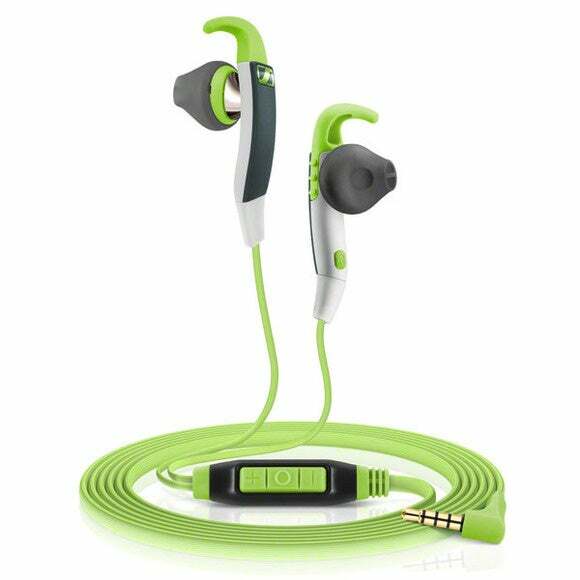 The MX 686Gs look like typical sports headphones: The earbuds have contoured covers and rubbery hook attachments that tuck into your ear’s curves and help the buds stay in place during intense workouts. The neon green cord is oval-shaped and tangle-proof, with a built-in three-button remote (volume up/down, play/pause/skip) and a microphone. Sennheiser's MX 686G Sport were the best-sounding fitness earbuds we evaluated. They were also the least expensive. A nice bonus! You get a detachable wire clip and a Velcro mesh storage bag to store everything in. The wire clip fits snugly around the cord and clips to your clothing so you don’t get too much movement (and cord feedback) when you’re moving around a lot. It’s a little surprising that Sennheiser doesn’t include different-sized earbud covers in the box, but these buds did fit both me and my husband, so perhaps you don’t really need them. I found those hooks to be just a little too rigid, but they are adjustable—you can move up and down to accommodate larger or smaller ears. I really like how you can adjust them while you’re wearing them (most earbuds require you to swap out the fins/hooks/wings one by one), because you’re able to get a more precise fit. Having said that, they’re not the most comfortable earbuds I’ve ever worn, but they did stay in place during both cardio and lifting routines. Like most sports headphones, the MX 686Gs are sweat and water resistant; they’re also very durable. 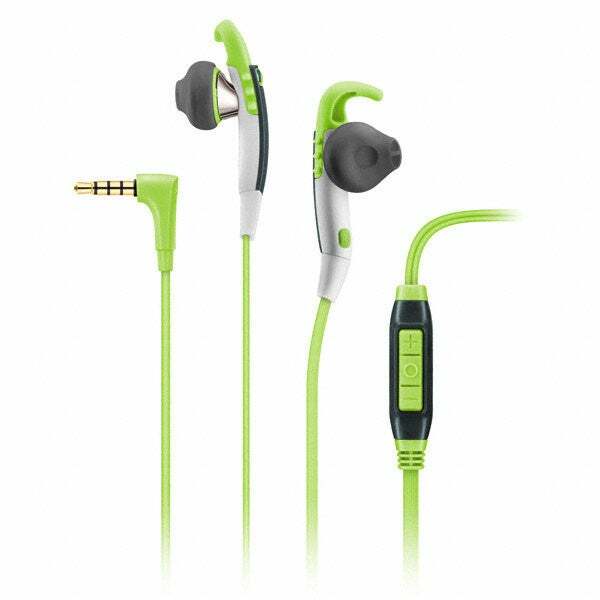 Sports headphones typical trade away some audio fidelity in pursuit of inexpensive durability and safety. The MX 686Gs are no different: These are not the best-sounding headphones you’ll ever wear. They’re deliberately designed to allow for some audio leakage, so that you can remain aware of your surroundings during outdoor workouts. The MX 686Gs nonetheless sound better than any other sports headphones I’ve used. I’m a big fan of bass, and the MX 686Gs deliver nice, thumpy bass without going overboard and muddying up the tracks. Mids are dynamic, treble is clear (although it could be a bit brighter), and the different levels sound great together. While the mix isn’t perfect, it’s very good for a pair of headphones that also lets you hear an oncoming car during your outdoor run. Should you put a pair in your gym bag? It’s easy to overlook boring, wired sports headphones when there are so many new models with intriguing new features crowding the market, but Sennheiser’s MX 686G Sport earbuds shouldn’t be ignored, especially if audio performance is your number-one criterion. You won’t feel as though you made too many compromises in your quest for earbuds that can stand up to your exercise regimen.